The objective of the Model United Nations is to seek, through discussion, negotiation and debate, solutions to the various problems of the world. In the process, the participating students learn to adopt views and attitudes other than their own and break away from narrow national interests and develop international cooperation. The research and preparation involved in the Model United Nations, the negotiations and debate, give the young people an insight into the world’s problems and enable them to understand the causes of conflict between nations. The Model United Nations contributes in fulfilling the aims and goals set by the founders of the United Nations in the Preamble to the Charter of the United Nations — namely to practice tolerance and live together in peace with one another as good neighbours. The Model United Nations also offers students an excellent opportunity to expand, develop and put into practice their language skills. East Africa Model UN: for high-school students from Kenya, Zambia, Uganda, Tanzania and the Democratic Republic of the Congo. Kenya Model United Nations (Kenya MUN) is a student run Non-Profit Organization affiliated to the United Nations Information Centre (UNIC). Our goal is to promote the ideals and principles of the United Nations among the youth – university students in particular. We seek to provide young adults with a multilateral platform to discuss various global issues that are addressed by the United Nations and its Organs. Kenya Model United Nations, runs throughout each calendar year. During such time we carry out a multitude of activities from mock debates, youth forums and varied corporate social activities (CSRs). The pinnacle of our calendar year is our Main Conference, held at the United Nations Offices at Nairobi (UNON) in March. KenyaMUN strives to ensure that the committees and organs that are simulated provide an educational and comprehensive look at a diverse range of pressing issues, during our annual Kenya MUN conference and mock debates. Our Director General’s work throughout the conference to ensure debate is as realistic as possible, in order for our delegates to get a sense of the complexities of real-world international diplomacy and politics. In addition, we aim to place an unequalled emphasis on cooperation and compromise rather than on the supremacy of any one country’s position. In this way, delegates get a chance to learn about current international affairs, discover and represent a country’s position. East Africa Model United Nations (EAMUN) was started in 1982. It is one of the only MUNs to hold its conference in official United Nations territory and allows students who attend to further immerse themselves into the world of the United Nations. The slogan for EAMUN is “Building leadership for tomorrow” which is exactly what we do. MUN helps students gain self confidence, public speaking skills and a vast knowledge of current global issues all of which are attributes of the modern day leader. Tremendous support for both the MSMUN and EAMUN programs is offered by the staff at the UN headquarters in Gigiri, Kenya. This support together with the growing popularity of both of these programs has provided the resources to continue to build up the program and maximise the experiences of all our delegates. We look forward to implementing a number of changes and improvements this year that will further enrich our MUN program and make it even more enjoyable for all those involved. 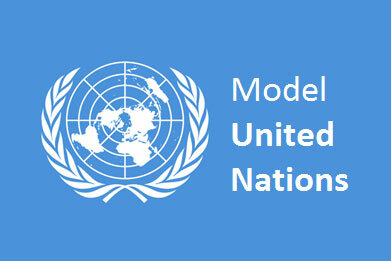 The Middle School Model United Nations (MSMUN) is a conference that is intended for middle school students. This programme is an excellent platforms for students to hone a number of skills including debating and public speaking skills, journalistic talents, leadership skills as well as providing an invaluable opportunity for students to develop their self-confidence. Student involvement continues to expand to include more and more students from not just Nairobi but also from all over Kenya and other countries. Tremendous support for both the MSMUN and EAMUN programs is offered by the staff at the UN headquarters in Gigiri, Kenya. This support together with the growing popularity of both of these programs has provided the resources to continue to build up the program and maximise the experiences of all our delegates. We look forward to implementing a number of changes and improvements that will further enrich our MUN program and make it even more enjoyable for all those involved. Despite the presence of multiple Model UN conferences at College/University, National and even Regional levels in Africa, the idea of bringing students in general and African students in particular from around the world to single forum to discuss and resolve the continent’s issues have never been realized before AfrO|MUN. AfrO|MUN, which has been founded and organized by MUNASTU, aspires to promote the goal and mission behind the foundation and establishment of Model United Nations: to bring together like-minded and goal oriented youth possessing the capacity to resolve issues through diplomatic negotiations. We have a vision of all African students around the world coming and working together in one accord towards the achievement of the most vibrant MUN experience. To stand collectively, debate on pressing issues facing the continent and strive together for creative, innovative solutions for Africa’s problems and to show the creativity and passion the youth of Africa has for a better Continent. Is to hold a successful International conference which serves as a platform for the empowerment of African students. The conference shall serve as a forum in which African students from colleges/ universities around the world can meet and discuss some of the challenges facing the continent today while creatively taking positions as leaders and coming up with solutions to some of the problems raised for discussion by engaging in constructive, intellectually stimulating debates. Additionally, the conference aims to encourage intercultural dialogue, and promote solidarity of African students all over the world in an attempt to nurture existing friendships as well as create new networks around the world.